Several International Students’ Days will take place at LMU in the coming weeks, and offer current students and all others interested will have several opportunities in the coming weeks to learn more about the practicalities and the advantages of studying abroad. The 2013 series begins with the Australia-New Zealand University Fair on 11. November. Between the hours of 11:00 and 16:00, representatives of 30 universities in the Antipodes will be on hand to offer advice on programs for students from overseas who wish to study Down Under. Whether you are considering spending only a single semester or enrolling in a Bachelor’s, Master’s or PhD program, on a tour of the booths, lectures and workshops you are sure to find what you need to know, including information on university fees. Former exchange students who have already sampled university life on the other side of the world will share their experiences and provide tips on how one goes about making the necessary arrangements to attend university courses in Australia and New Zealand. The event is organized by the Ranke-Heinemann Studienstiftung, which will provide guidance on funding mechanisms and other financial matters and application procedures. The British University Fair, organized by the British Council, follows a fortnight later (from 11:00-15:00) on 25. November. In all, 29 British universities – including the University of Oxford and the University of Essex – will be represented. Here too, students who are contemplating a course of study in the UK can obtain information on programs, application procedures and admission requirements. There will also be a talk (12:00-13:00) on the IELTS (International English Language Testing System), successful participation in which is accepted by over 8000 universities around the world as proof of proficiency in English. This year’s series of International Students’ Days ends on 26. November, with a program of lectures and information sessions on university studies in diverse parts of the world, organized by LMU‘s International Office. From 9:30 until 16:30 on that day, visitors will find a veritable information exchange in progress, attended by representatives of the Canadian Consulate in Munich, the Bavaria-India Center and the Amerika Haus München, among others. Parallel lecture series will also be given (in German) in Senatssaal I and II. These will feature talks on “Going Abroad with ERASMUS” (“Ins Ausland mit ERASMUS“) and “Who, Where, What, When, Why: Preparing to Study Abroad” (“Wer, wo, was, wann, warum? Erste Schritte zum Auslandsaufenthalt”) and related topics. 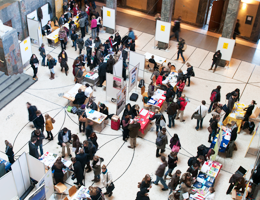 All of the above-mentioned events will be held in the Atrium of LMU’s Main Building (Geschwister-Scholl-Platz 1).